I first took notice of enamel advertising signs a couple of decades ago when I began to regularly pass one on my way to college. Affixed to the front of a house was a small navy-blue plaque with the word ‘Corona’ emblazoned in a striking orange typeface. The colours and design wholly appealed to me and although I wasn’t in a position to start collecting signs at that time, I began to look out for them on my travels and in the interim tried to find out more about their history. 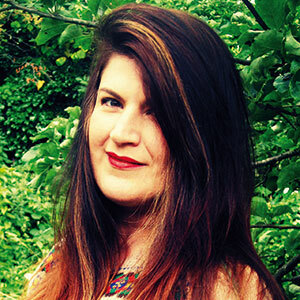 The Victorian era evinced the mass manufacturing of a wide array of food and household products that catered to an increased demand, fuelled in turn by the growth in consumerism. These consumers could be found amongst the wave of prosperity that had boosted people up into the middle classes and also within industrial areas where the opportunity to earn a higher wage was becoming available. To further promote their brands to this wider demographic, companies started to use a new method of colour printing: chromolithography, in their advertising which enabled the printing of multi-colour images of a greater depth and range of colour than previously. Brightly coloured packaging, posters and trade cards proliferated the shelves of grocers, chemists and confectionary shops up and down the country; catching the consumer’s eye and drawing them into brand recognition and loyalty. This colourful advertising was shortly adopted into another area of successful British manufacturing: metalworking. The first person to fully realise the potential of metal adverting signs was Benjamin Baugh, the manager of a Birmingham-based enamel works. Baugh developed a process for the large-scale enamelling of signs, subsequently patenting this in 1859. 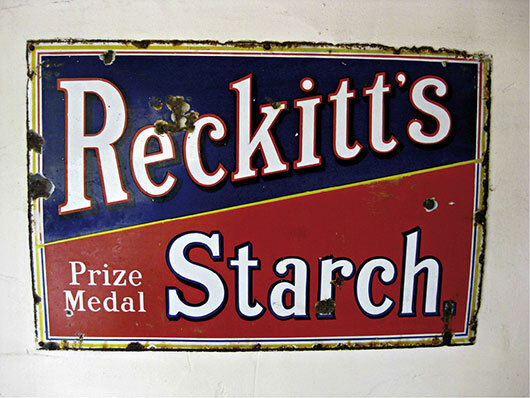 By 1889 he had set up a dedicated company, ‘The Patent Enamel Company’, to exclusively produce advertising signs. Other manufacturers soon followed in his wake; many similarly hailing from the Midlands with its metalworking heritage and foundries that enamelled everything from baths to kitchenware. 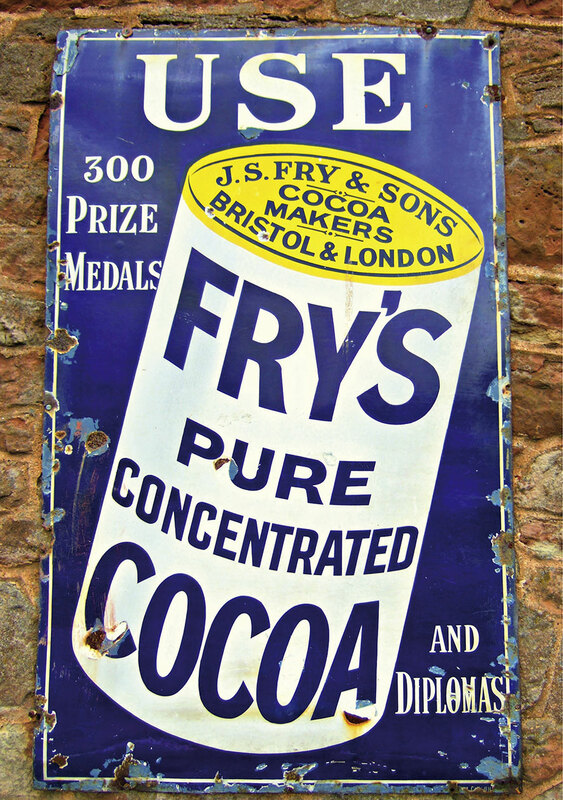 Household brands such as ‘Fry’s Chocolate’ and ‘Sunlight Soap’ were keen to have their chromolithographed images, logos and slogans transposed onto enamelled signs. The advantages of this new type of advertising were highly beneficial as companies would have previously relied on transient posters being tacked up in shops or pasted onto hoardings. The robust signs were perfect for brand promotion and rapidly began to advertise a diverse range of products including livestock feeds, removal companies and sewing machines. They could be permanently fixed onto the front wall of shops, at railway stations and even on the side of omnibuses, thus gaining maximum advertising exposure. A plethora of signs on the front and side elevations of shops can be seen in photographs dating from the late nineteenth century onwards; imbuing the walls with a colourful and eclectic patchwork of signage. Weatherproof and virtually fade-resistant, their durability was an added bonus. However, their prominence was a magnetic draw to naughty children who found a new game to play: throwing stones up against the signs to hear the ensuing metallic ‘ping’ or using them as catapult target practice. The signs’ brand identity was an all-important factor as companies had to both contend with their competitors’ products and also establish an identity in the form of a logo or use of particular colours that consumers could immediately recognise. Although the Education Acts of the late nineteenth century had provided a basic grounding the ‘three Rs’, adult illiteracy amongst the working classes was very common. Though advertising signs thrived in the first third of the twentieth century, the increase in metal production engendered by the Second World War virtually ceased their manufacture. This and the introduction of American-style poster hoardings in conjunction with television advertising in the 1950s accelerated the decline. Relics of past decades, signs and the buildings they were fixed to, began to disappear as part of the post-war building boom and the desire to start afresh. 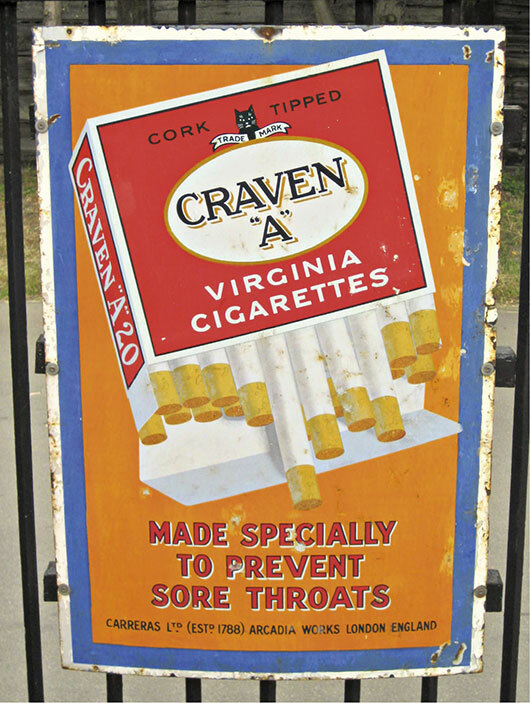 Enamel signs were perceived as being ‘junk’. 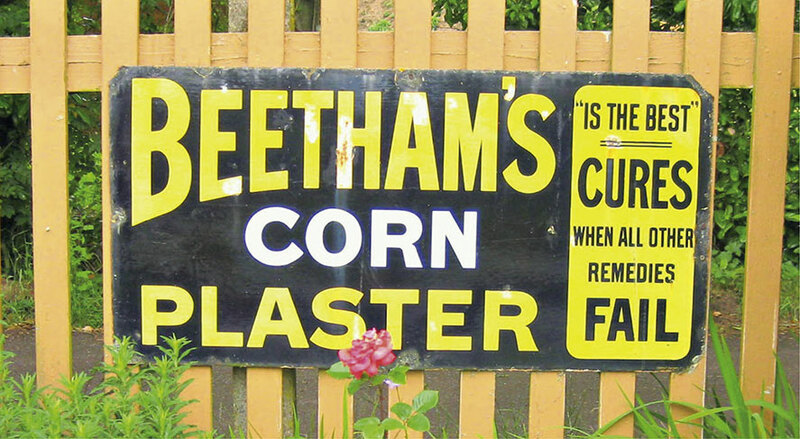 My father can remember discarded signs being used as edgings to allotment plots in the 1960s; whilst a friend has more recently found tucked away in a Midlands field, a small and very dilapidated agricultural shed constructed entirely of large ‘BP’ signs. Fortuitously, many current and former shops still retain their historic signage as their heritage value is acknowledged and appreciated. 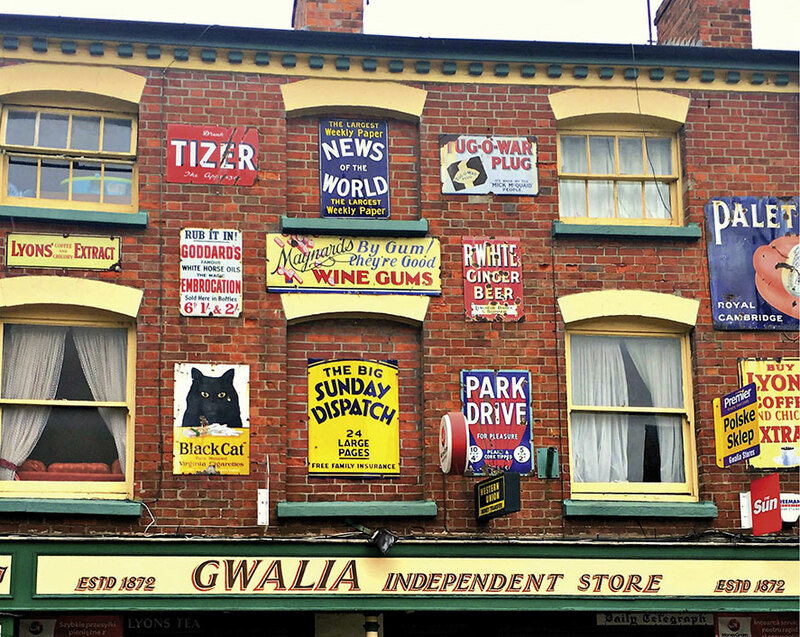 One prime example is Gwalia Independent Stores in Ross-on-Wye whose frontage is a veritable patchwork of desirable signage; from the classic ‘Black Cat’ cigarettes to the preposterously and indecently porky ‘Palethorpes’ sausages. 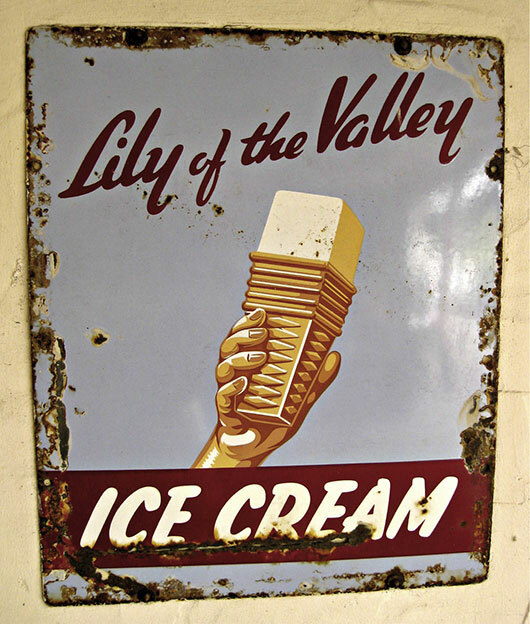 The wave of nostalgia for Victoriana and Art Deco prevalent in the early 1970s saw a new-found interest in enamel signs. 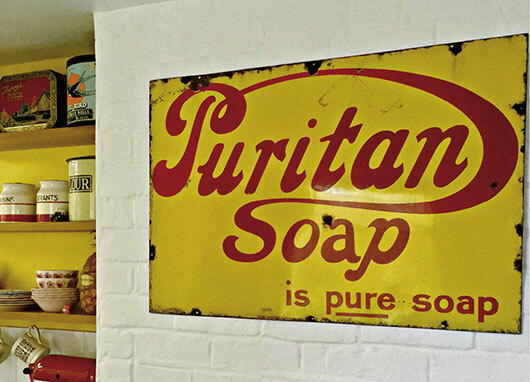 Their value – both in artistic and monetary terms – rose significantly as people began to collect signs for their intrinsic beauty and place in advertising history. This attraction is still strong decades later, which means that you could find yourself paying at least a couple of hundred pounds for a sign in a decent, albeit chipped condition. Certain ‘iconic’ signs like the teacup and saucer shaped ‘Nectar Tea’ and the colourful ‘Sunlight Soap’ with its £1,000 reward logo can command prices in excess of £300, while the aforementioned ‘Fry’s Five Boys’ sign in excellent condition can exceed the £1,000 mark. Reflecting this appeal, many general auction houses now have specialist sales throughout the year focussing solely on advertising collectables. Another good hunting ground is railwayana auctions as the more common signs can be brought for comparatively modest prices, due to the fact that many collectors who attend these are on the search for rarer examples. 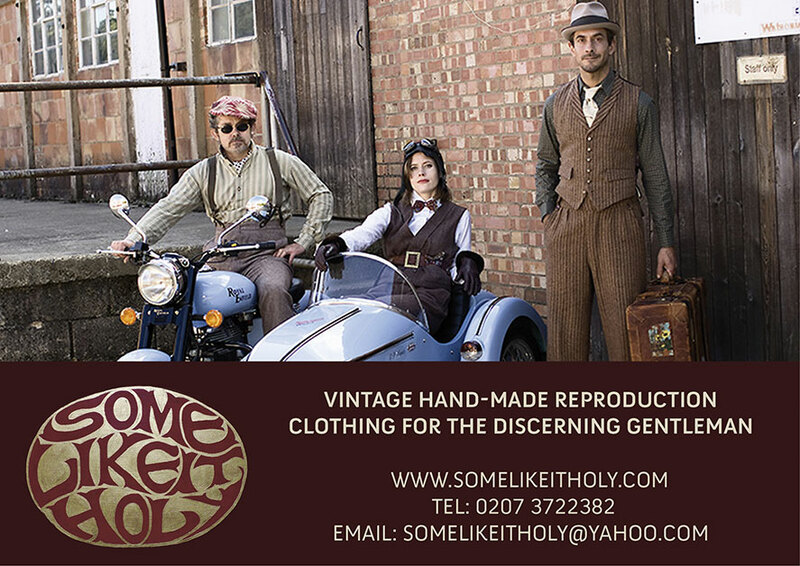 Enamel signs now appeal to a wide range of people: from vintage lifestylers, automobilia and railwayana collectors, to those who can’t resist the chortle-value of having a sign on their wall boldly proclaiming ‘Churchman’s Counter Shag’ – ask a pipe smoker about that one! 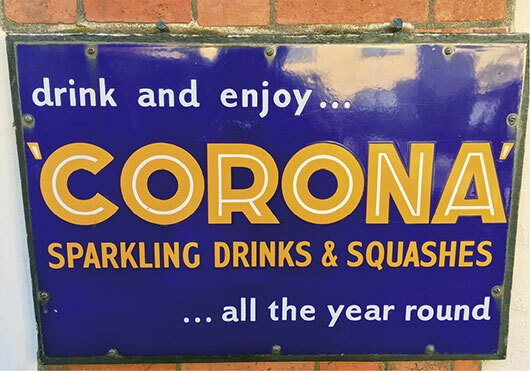 Postscript: The original ‘Corona’ sign that started off my sign fascination? I’m pleased to end on the fact that it’s still in place.